Interesting newspaper clipping found whilst researching the names on the Devoran Roll of Honour and War Memorial for this web site / blog. During the village hall restoration and paper conservation of its signs such as the Roll of Honour, a hidden first draft panel turned up behind the finished one. This adds to several lists of Village or Parish names – the granite war memorial, the brass plaque in the church, the finished Roll of Honour, the first draft 1914-1916 panel and now this January 1915 list in the local West Briton newspaper. Why the Variations from the 1914 “Names on the Roll”? This listing shows some of the men from Feock parish (including Devoran and surrounding hamlets and villages) who were on active service by January 1915. It is different from the Roll of Honour 1914 lists. Some names like E. Searle don’t appear on the first draft 1914-16 roll of Honour draft list until the finished Roll of Honour is completed after the war. This may be as Searle is listed in the 1919 / post war finished Roll of Honour listing amongst a small group of Devoran men in the Mercantile Marine (in what we would now call Merchant Navy), as opposed to regular Royal Navy men like William Geach, Thomas Tyack(e) or Charles Brabyn. Perhaps in 1914 their regular seaman’s job in and out of ports like Falmouth and the ailing Devoran or Point Quay serving with the Mercantile Marine would not at first be regarded or recorded as on war service like the other Devoran volunteers or veterans. This may have changed when the realities of the U -Boat submarine blockades, news of torpedoing of Merchant Navy ships off the Cornish coast and rationing at home made it increasingly clear to people that the Mercantile Marine men were every bit as exposed to danger as Devoran men in the trenches or the Royal Navy. Anyway a few more helpful clues like first names to identify more of the “Names on the Roll”. Posted by Mark Norris, Devoran War Memorial project, May 2016. This entry was posted in Cornwall, Devoran, Merchant Navy, war memorial, WW1 and tagged 1915, Cornwall, Devoran, Devoran Village Hall, Devoran War Memorial, Merchant Navy, war memorial, WW1 on May 15, 2016 by worldwarzoogardener1939. Able Seaman Lewis Adams D/J/12221, Royal Navy, HMS Chelsea died aged 46 on 1 April 1941. He has no known grave and is listed on the Plymouth Naval Memorial, panel 46, column 1. 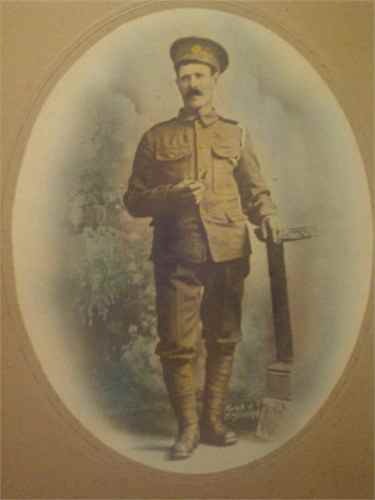 Listed on CWGC as the son of James and Mary Ann Adams. The local connection is his wife, Dorothy Mary White Adams of Devoran, Cornwall. This entry was posted in Cornwall, Devoran, war memorial, WW2 and tagged Cornwall, Devoran, war memorial, WW1 on April 1, 2016 by worldwarzoogardener1939. A photograph of Edwin Marshall of Devoran has been found, in time for the centenary of his death en route to Gallipoli on the Troopship Royal Edward which sank on 13 August 1915. Thanks to Olwen Martin, who still has relatives in the village, for permission to use this photo. Another face added to a name on the war memorial! This entry was posted in Cornwall, Devoran, war memorial, WW1 and tagged 1915, Cornwall, Devoran, Devoran War Memorial, Edwin Marshall, Gallipoli, Great War, Royal Edward, war memorial, WW1 on December 6, 2014 by worldwarzoogardener1939. Today is the 70th anniversary of the death on active service in Holland in WW2 of J.B. Tallack, reconnaissance unit, Royal Armoured Corps. His name can be found on the Devoran War Memorial, where I stopped by today to remember him, and also on a plaque in Carnon Downs Chapel. As you can read on his entry, his relatives have planned to revisit his grave in Maasbre this year for the 70th anniversary, as they and Tallack’s parents did in the past. He is buried in a small row of his five Royal Armoured Corps comrades in a Dutch cemetery. 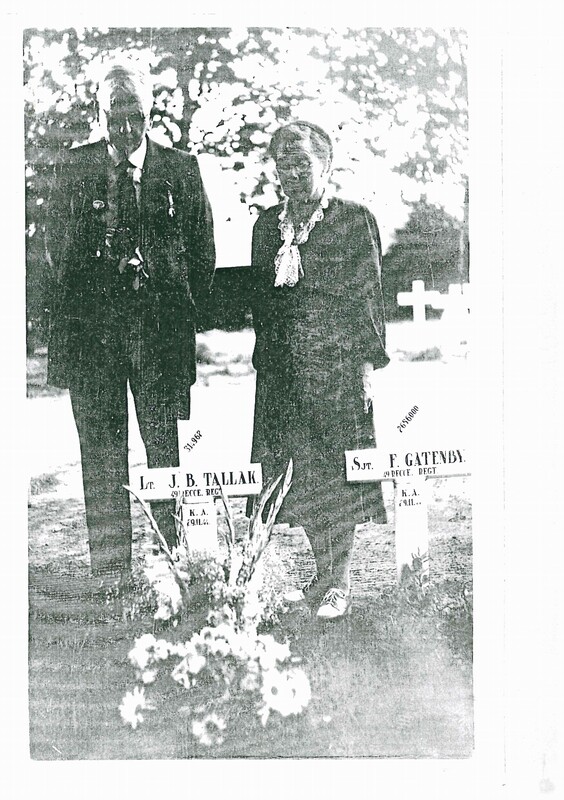 A faded photocopy of a photo of a visit to Tallack’s original cross, The visitors are his parents John and Flora Tallack. Photograph c/o Tony Dyson’s 2007 research. 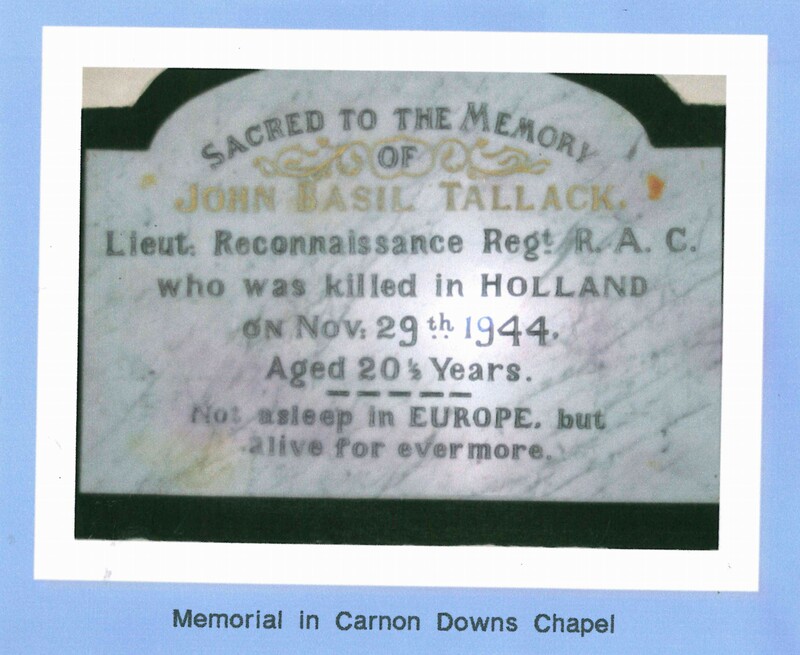 J.B. Tallack – Remembered by his family and in his home village. This entry was posted in Cornwall, Devoran, war memorial, WW2 and tagged 1944, Cornwall, Devoran, Devoran War Memorial, John Basil Tallack, Royal Armoured Corps, war memorial, WW2 on November 28, 2014 by worldwarzoogardener1939.